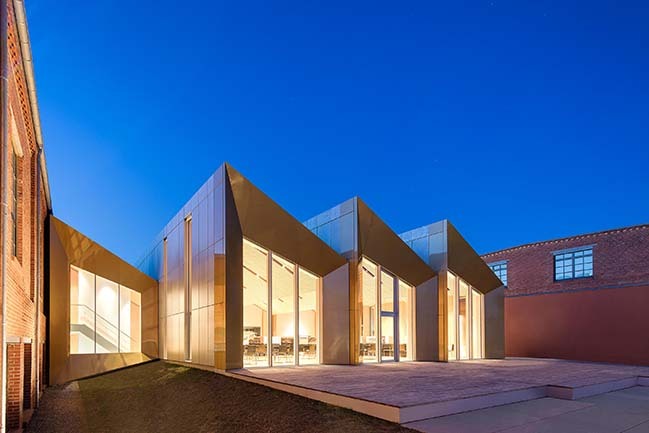 The August Horch Museum is being expanded by ATELIER BRÜCKNER. 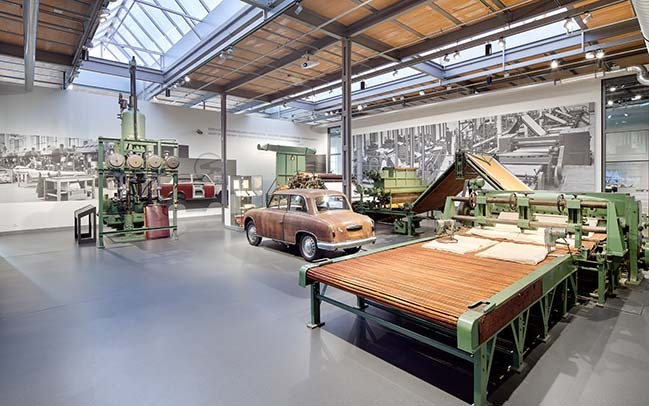 This includes the refurbishment of a historic former Audi work floor. From the architect: Exquisite, luxurious, tasteful and elegant: Horch cars continue to evoke enthusiasm with their excellent design, their elegance and their solid execution. 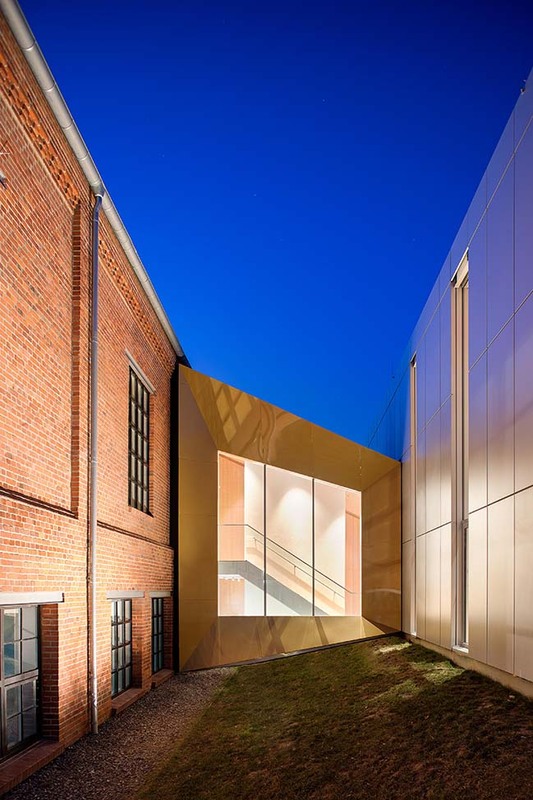 The extension of the August Horch Museum in Zwickau turns these qualities into a three-dimensional experience. 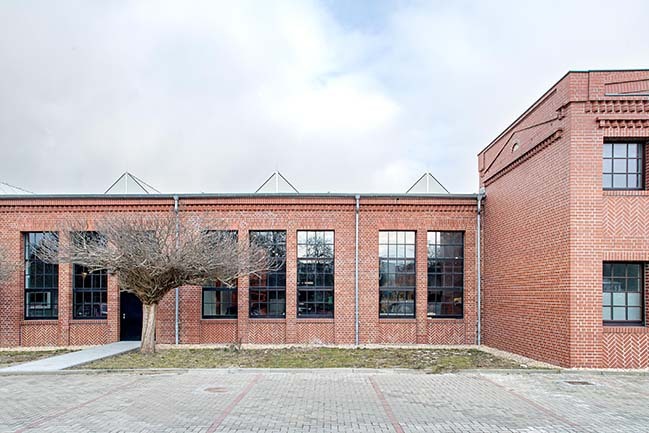 ATELIER BRÜCKNER was commissioned with the upgrading of an impressive industrial building in line with the regulations governing the preservation of historic monuments. 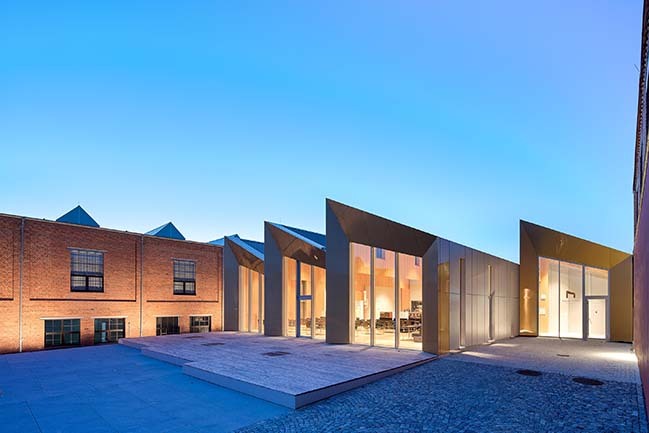 And the Atelier was given the task of designing a new building, which connects the already existing museum to 5,000 square metres of new space in the historic building. The new building interprets the theme of a car body with a gleaming metal surface: like an automobile on show, it is parked between the former production halls of car brands Audi and Trabant. 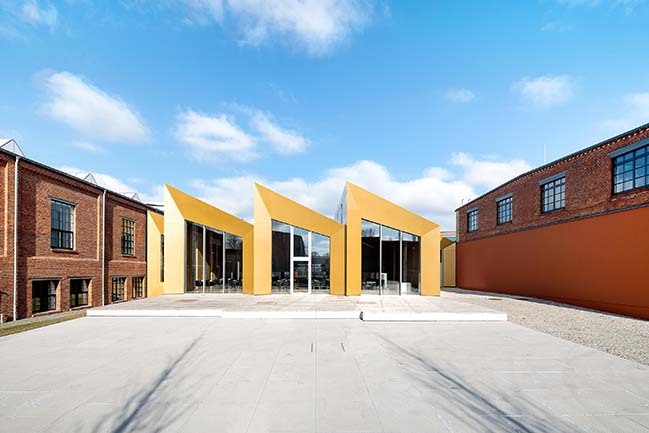 Respectfully interposed in the historic ensemble, it takes the eaves height of the existing buildings as a binding variable and, reduced in depth, docks onto the historic clinker front. Its five rhythmically expressive sheds, between 4.50 and 7.50 metres high, interact with the industrial surroundings by means of their own crystalline force. 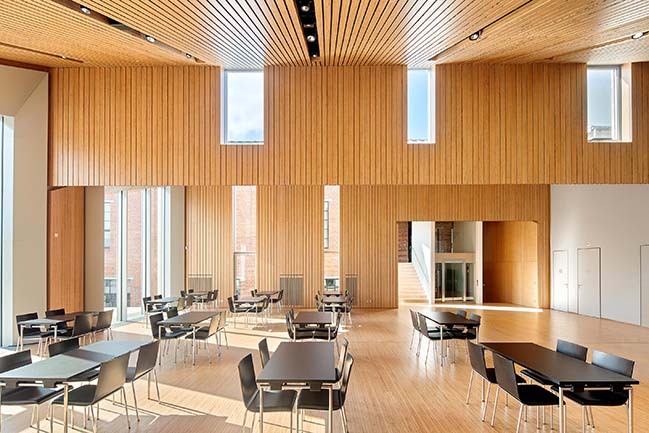 In their staggered dynamism, they lend character to the interior and to the outside area as well. 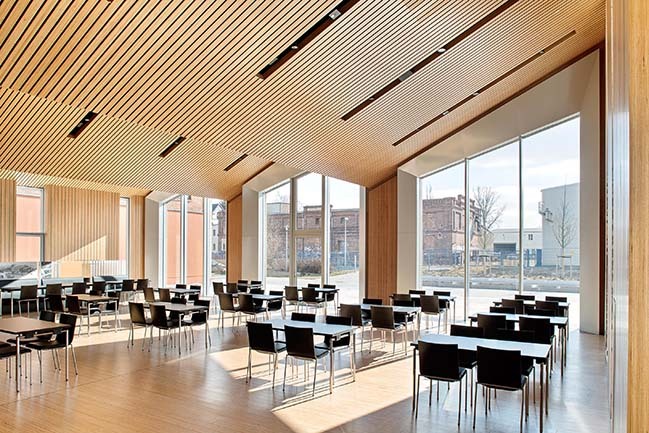 The middle sheds accommodate a spacious restaurant, the furnishings of which are reminiscent of a car's interior: oiled beechwood and grey synthetic leather framed by strips of chrome. Generously glazed facade elements open up views into this car-inspired casket. They have wide, three-dimensionally formed steel-sheet frames, arranged serially and shining metallically like the radiator grille of an automobile. 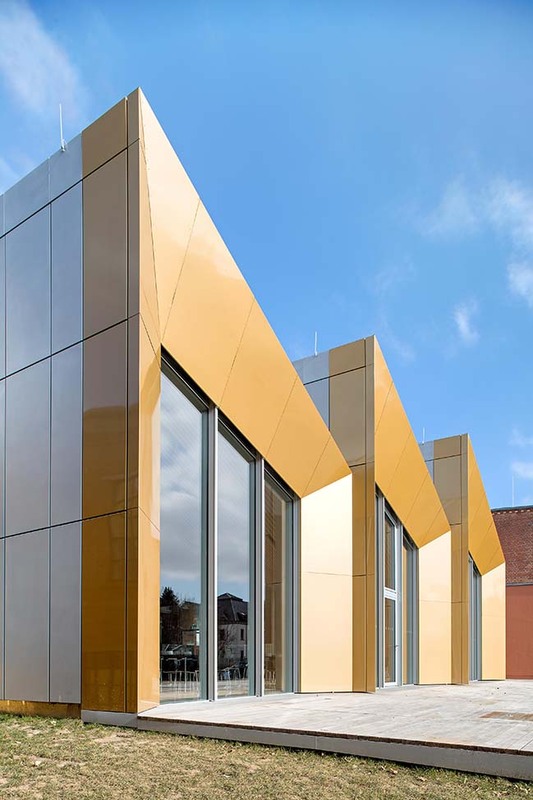 Depending on the amount of daylight, the material quality becomes especially clear, attractively contrasting with the surrounding architecture. 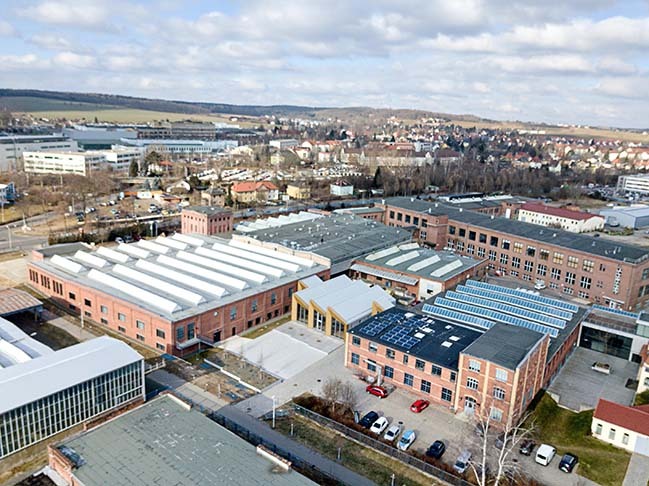 The heritage-protected factory halls from the years 1912 and 1924, where August Horch produced the first Audi models, enclose the museum extension and are simultaneously its largest exhibit – a historically important contemporary document. 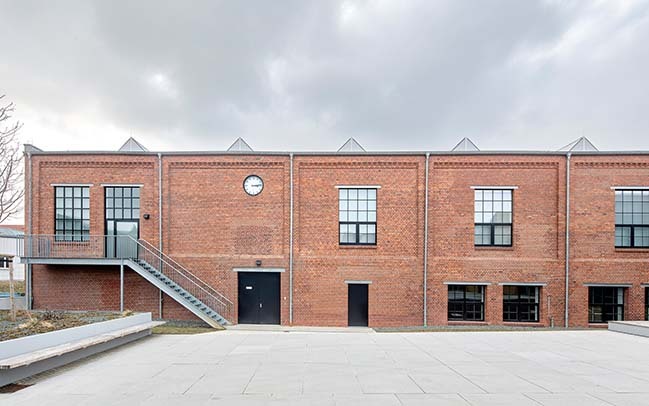 Its facades made of clinker brickwork have been refurbished, the steel construction has been sand-blasted and newly coated, and the flat roof with hourdi-type hollow-tiles and skylight strips in the shape of the ridged roof has been restored in line with the regulations relating to the preservation of historic buildings. The slender steel-skeleton building now serves as an authentic framework for the new exhibition. 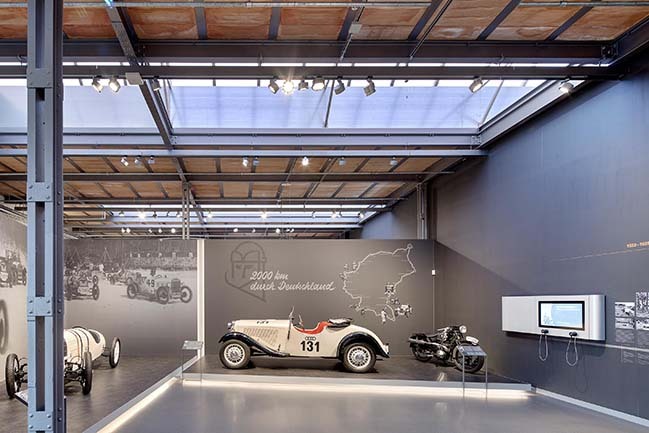 Since as long ago as 2004, the August Horch Museum has been presenting more than 100 years of automobile history at the historic location. 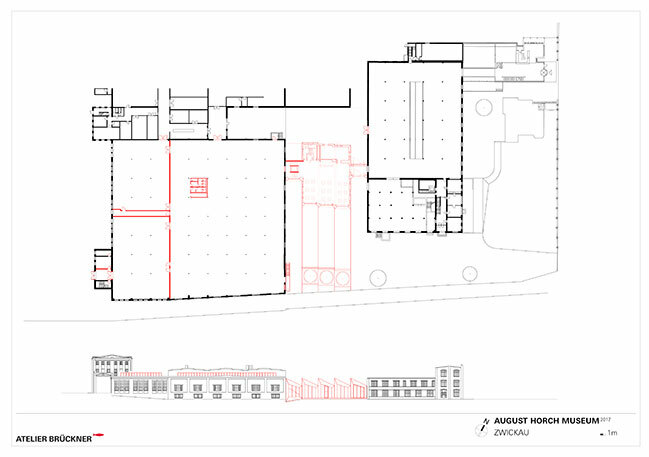 Opened in November 2017, the extension has more than doubled the museum's exhibition space. 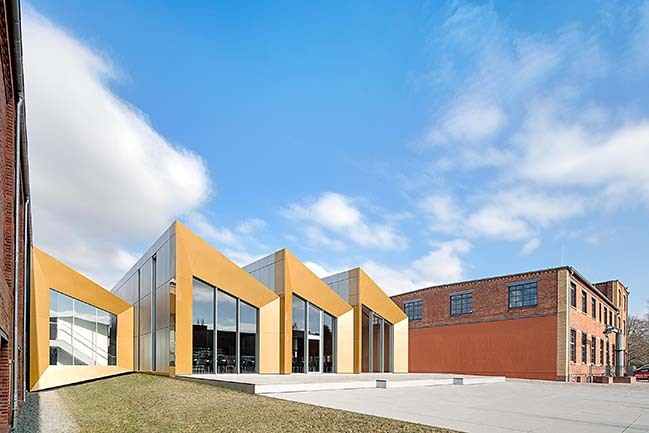 On 24 March, the award of the Zwickau ArchitekturForum was bestowed on this building project. 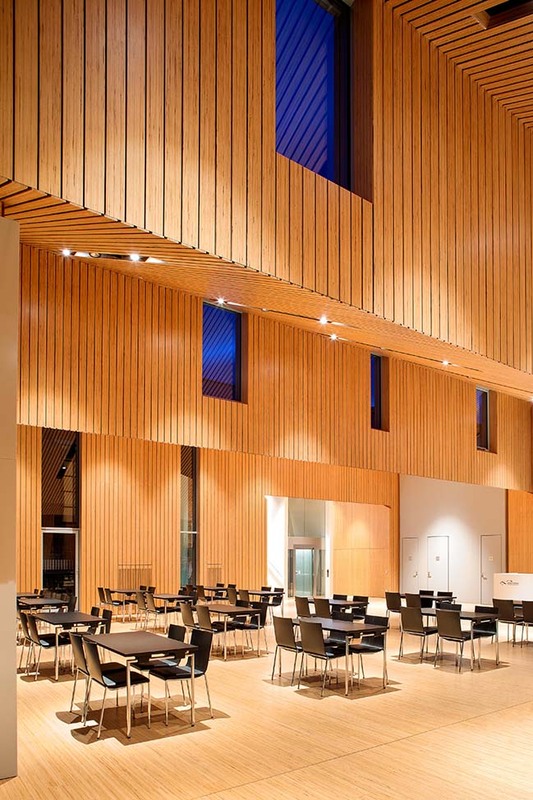 The client's prize honours especially successful architecture – exemplary new buildings and renovations. 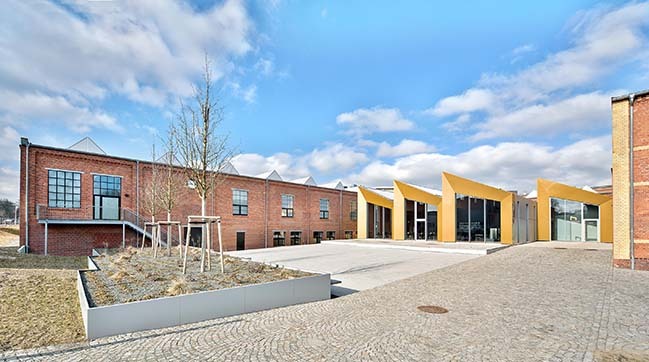 "The jury reached agreement very quickly in this case", said Prof. Dr. Rainer Hertting-Thomasius, former dean of the faculty of architecture at the Westsächsische Hochschule Zwickau. 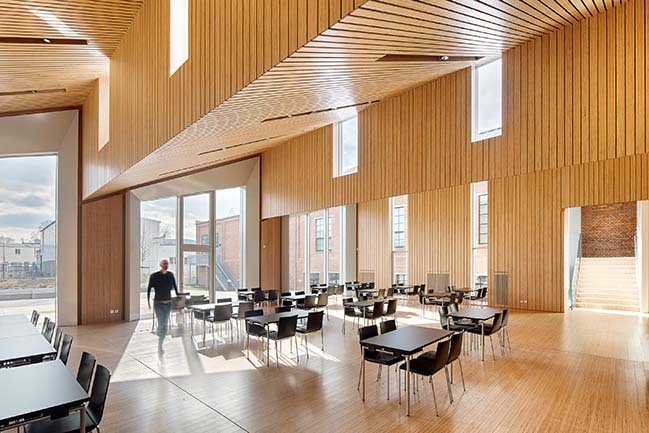 His laudatory speech, given in the context of the prize-awarding ceremony in the Zwickau town hall, remarked on the "sensitive approach" of the architects.